Welcome to this week's Homemaking Link-Up Weekend! I spent some time yesterday rearranging some of my decorations and things and wanted to share with you all one of my most treasured heirlooms! My great-great grandmother, Cora Jean Lasiter Bradley, made this for her son, Efeard, in the early 19-teens. Efeard was the father of my grandpa George. Recently, my mom had the chance to meet grandpa George's step-sister who passed this quilt on to mom---and mom passed it on to me two years ago when I had our son, Liam Bradley. Aren't there some neat fabrics in here? I have been keeping it in my bedroom so it didn't get messed with, but today I decided to move it out to the living room for everyone to enjoy! Have you heard my GOOD NEWS yet? Head over to my announcement post to check it out! Also, as a reminder, I'm teamed up with Anitra from The Mama Zone in a fun twist on the old-fashioned bloggy giveaway! Please visit my Hop & Hunt for all the details and enter to win some of my yummy homemade carmels! Please join the link up and show off your favorite posts! Beautiful! 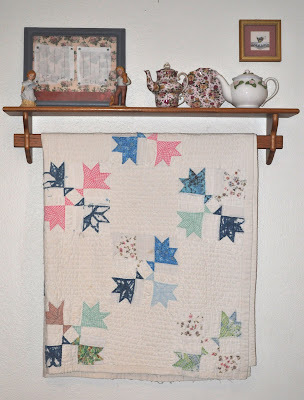 My husband's mom was an awesome quilter and we have many things made by her and his grandmother.. Sadly, his mom passed away 4 years ago, but we have these great quilts to remember how much of an awesome woman she was! Wow what a beautiful quilt! I have one my grandmother made and one my great grand mother made. Family heirlooms are indeed treasures. Oh Sarah it's so pretty i love quilts and what a wonderful treasure to have! You blog is adorable i love the "who's"...that what we call owls in our family! Sarah, one thing we have in common, love of quilts. I have several that I inherited and some I bought. I have both new and vintage. I treasure each of them. I really like this one and the story behind it. Somehow I goofed. Could not use the Mr. Linkey that would have shown my thumbnail of my post. I will keep trying. What a treasure! How wonderful to have your family quilt - how lovely it's been passed down and down again. Enjoy! Sarah the quilt is beautiful and definitely a treasure!